(From left) Tan Sri Dr. Munir Majid, President of ASEAN Business Club; Mr. Arin Jira, Chairman of ASEAN Business Advisory Council; Mr. Paul Gwee, Secretary-General of ASEAN Bankers Association and Joey Concepcion, Chairman of ASEAN-Business Advisory Council Philippines at the MOU Signing Ceremony held in Bangkok. 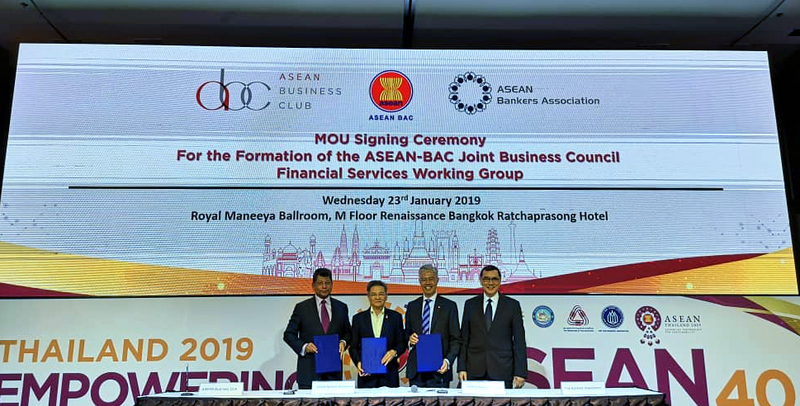 ASEAN Business Club (ABC), ASEAN Business Advisory Council (ASEAN-BAC) and ASEAN Bankers Association (ABA) today signed a Memorandum of Understanding (MOU) to strengthen cooperation and collaboration through ASEAN-BAC Joint Business Council Financial Services Working Group. This MOU will facilitate the promotion of financial development and integration, policy studies and cooperation between countries represented by partners and ASEAN, through ASEAN-BAC and ABA respective organisations and the organisations affiliated parties. This include the co-hosting of events of mutual interest: forums, exhibitions, seminars, investment fairs, etc as well as providing knowledge sharing and mutual promotion of ABC, ASEAN-BAC and the ABA. “The ASEAN Business Club is pleased to contribute to the financial integration agenda of ASEAN to facilitate cross border trade in ASEAN as the lead proponent of the working group,” said Tan Sri Dr. Munir Majid, President of the ASEAN Business Club. The signing of the MOU took place on the sidelines of the ASEAN-BAC Seminar – “Empowering ASEAN 4.0” on 23 January 2019 in Bangkok, Thailand.